The Stanier "Black Five" 4-6-0s were the most common type of locomotive on trains on the main lines of the Highlands during the last twenty-five years of steam haulage to 1961. After a gap of fourteen years LMS 5025 resumed the class's connection with the region when it arrived on the Strathspey Railway. Out of service since 1994, restoration of the engine to working order has now begun. 5025, the sixth "Black Five" to be built, was one of the first batch, 5021-5029, which were sent to the former Highland sheds at Perth (North) and Inverness in August and September 1934. Their work was initially mainly on the Perth to Inverness route, but in the second week of February 1935 5028 was reported in a later Railway Magazine as working the 10.20 a.m. from Inverness to Wick on alternate days. 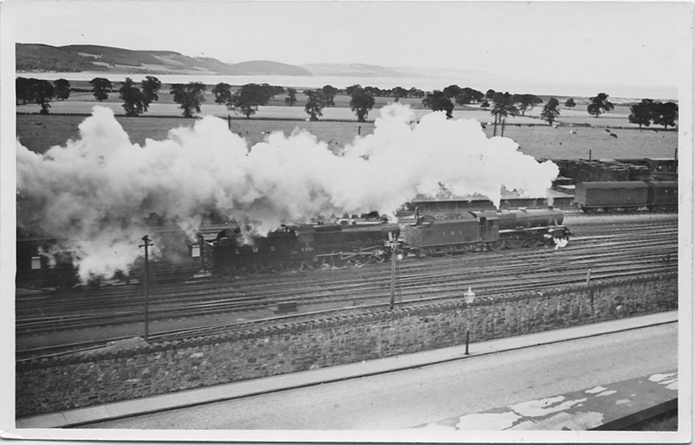 Two "Black Fives" double-head a train for the south out of Inverness in 1936. The first engine is one of the domeless boiler group, 5021- 5029, which arrived on the Highland in 1934. The second locomotive, with a domed boiler, is brand-new 5361 which had just been delivered. The class were soon hauling the main line trains between Perth and Inverness and Inverness and Wick, with 35 being allocated to Inverness in 1942. 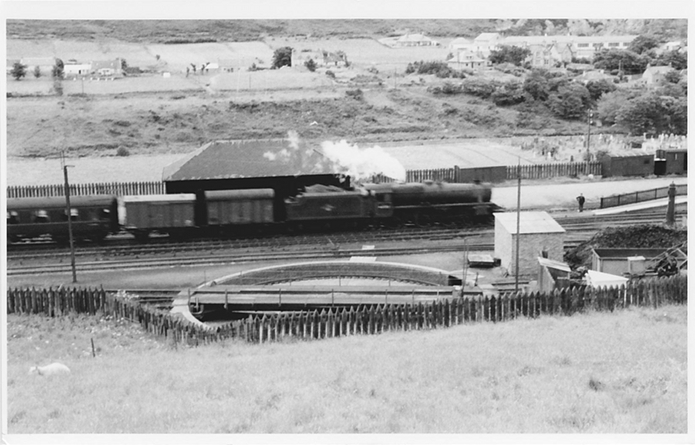 In 1946 a new 54ft turntable was installed at Kyle of Lochalsh, which allowed "Black Fives" to work to work the Kyle line for the first time; this turntable is now installed at Aviemore on the Strathspey Railway. Further south in the Western Highlands, "Black Fives" started to work to Oban in 1939 after bridge strengthening work. In the early 1950s the class also started to work Glasgow to Fort William trains, completing their dominance of railways in the Highlands. "Black Fives" disappeared from the region after dieselisation in the early 1960s, although preserved members of the class have returned to work the Jacobite steam service between Fort William and Mallaig and steam specials on several lines in the region, such as the Great Britain lV last year. Only one preserved "Black Five" has, however, has been permanently based in the Highlands. One of the last steam locomotives to work on British Railways in 1968 was 45025. On withdrawal it was purchased by W.E.C.Watkinson for use on what was to become the Strathspey Railway. Soon restored to its original LMS number, 5025, the engine worked on the Keighley and Worth Valley before moving north in 1975. 5025 hauled regular trains on the Strathspey Railway from 1977 onwards, as well as special trains on the Perth and Kyle lines. In 1994, however, the locomotive's boiler certificate expired and it was clear that a major overhaul was needed before it could return to service, with significant work on the boiler and the construction of a new tender tank being necessary. Since the mid-2000s the W.E.C.Watkinson Trust has been raising funds to undertake 5025's restoration to working order. The estimated cost of £354,000 was a daunting one, but the Trust has secured grants or promises of support from the Strathspey Railway Company, the Strathspey Rail-way Trust, the Heritage Lottery Fund and the Strathspey Rail-way Association. Most importantly, more than a quarter of the sum needed has been donated in response to our appeals or is anticipated from the regular standing orders from our existing supporters. A Black Five enters Helmsdale with a train from Wick in 1958. With the majority of the finance in place, the W.E.C. Watkinson Trust felt able to award contracts for 5025's restoration at the beginning of 2012. Ian Riley Engineering of Bury will carry out a major rebuild of the boiler, along with construction of a new tender tank and turning of the locomotive's wheels. The locomotive frames will remain at Aviemore shed, where work on the axleboxes, motion, dragboxes and valve gear will take place. It is hoped to complete the restoration of the locomotive in 2015, but £25,000 has still to be raised to ensure this. At the beginning of this year the W.E.C.Watkinson Trust launched an appeal for this sum and an appeal leaflet is enclosed with this Express. 2015 will be the 150th anniversary of the formation of the Highland Railway, and the return of service in the Highlands of a "Black Five", which characterised steam working on the HR for so many years, would be a very appropriate way to mark this. Your help to achieve this would be most welcome.